I've noted before that I've never really been able to "get" The Phantom. It always struck me as a brilliant concept, but I just couldn't find the right stories that really clicked with me. So I was really happy to get a review copy of The Phantom: The Gold Key Years from Hermes Press. Not that I necessarily knew it had especially great stories in it or anything, but it would be the largest chunk of Phantom stories that I've been able to read in essentially one sitting. 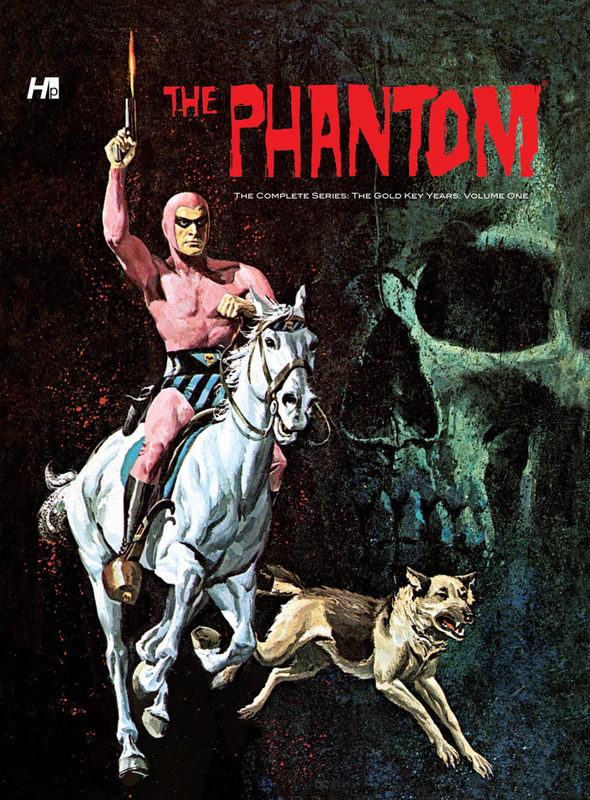 The book contains, to no surprise, reprints of the first eight issues of the Phantom comic book from Gold Key. The original comics went generally uncredited but, for the record, they're largely written by Bill Harris and drawn by Bill Lignante with painted covers by George Wilson. If I'm to understand things correctly, the stories represented in this volume were based on storylines from the comic strip, but re-worked to fit the comic book format. So, while everything was entirely redrawn, the pacing seems a little odd in places. But this also means that readers aren't bogged down with tedious and unnecessary fight scenes. I definitely have a better appreciation of the Phantom now that I've been able to read a good chunk of stories in one go, including adventures of both the 20th and 21st Phantoms. But that's all in the original comics themselves. What about this collected edition? The book itself is gorgeous. The Wilson covers look pretty spectacular throughout the book, and the Hermes Press art folks did an impressive job on recoloring everything. The recoloring is actually striking for what I think they did. They clearly had at least some of the original art, as evidenced by the reproduction of a couple of pieces. But the colors look to be taken from the original production, like they had all the color printing plates as well. BUT! It also looks like they went back and recolored all the figures and large blocks of background color so that they're more internally consistent. The resulting effect you get really clean, sharp colors where you tend to focus, but there's still some graininess here in just enough places to suggest that these are a half century old comics. There's no mis-registrations, but some occasionally lazy plate making from back in the day. It's a very interesting approach to recoloring old comics that I don't think I've seen before, and one that works surprisingly well, I think. There's also a three page introduction by Ed Rhoades, who's a huge Phantom fan and president of the US Phantom fan club. (I think. The club doesn't seem to be active any more, as far as I can tell.) It's obviously there to put the comics in context, and it does indeed supply some interesting background information, but it's a bit of a harsh read. It's a bit disjointed, and there's some awkward phrasing that left me unclear about several points. I can see why Rhoades was asked to write an introduction and it does have some information there, but I think it detracts a bit from the quality of the production. Aside from that, though, it is, as I said, a handsome book and certainly helped me to get a better handle on The Phantom. Of course, now I'll have to try to get my hands on all the other Phantom books Hermes is putting out! Nice acquisition, man. This sounds like a very well-made book here. Actually, I found the reproduction to be amateurish, which is why I decided not to buy it. I only have a mild historical interest in it, seeing as Lignante draws in Wilson McCoy's style, and I always preferred Sy Barry's modern look. What did you find amateurish about it? I'm not trying to be snarky and or invalidate your opinion, but I'm genuinely curious as to what about it seemed less than professional to you. What would they have needed to do differently to persuade you to buy it? Would a more contemporary approach to coloring worked for you? More and/or better annotations/contextual notes? Or is Lignante's art a deal-breaker regardless? Sean, I'm glad you liked the reproduction. I've read mixed reviews on the coloring and touch ups on other Hermes Press works. I don't own any, myself, but was looking to get into buying the Buck Rogers books. Any opinion on those? Hey, Chris! Unfortunately, I can't speak to the Buck Rogers books; I haven't seen any of them in person. The only Hermes books I've picked up so far are this and the Brenda Starr reprint. Both were well done, I thought, although I liked The Phantom's coloring better. But that may well have been because of better color choices in the originals. Larry The Duck: Future Comic Book Star? New Almost A Superhero Shirts Available!